These days, many drivers expect to find high-tech equipment in new vehicles. 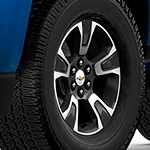 Luckily, Chevrolet has you covered with the new Colorado. This popular mid-sized truck has all the technology you would need to stay safe and connected wherever your travels may take you. One of the first things you'll notice when you step inside the Colorado at Edwards of Storm Lake is the large infotainment screen. The Colorado is available with the Chevrolet Infotainment system. It features a large touch screen display. The screen size and features vary based on the model you choose. You can get a system with built-in navigation and a number of useful applications. The infotainment can also be used for hands-free communication. It has wireless Bluetooth capabilities. Once you connect your compatible smartphone, you'll be able to make calls and answer texts all with the sound of your voice. Buttons on the steering wheel initiate voice commands while small microphones throughout the cabin pick up your voice clearly.